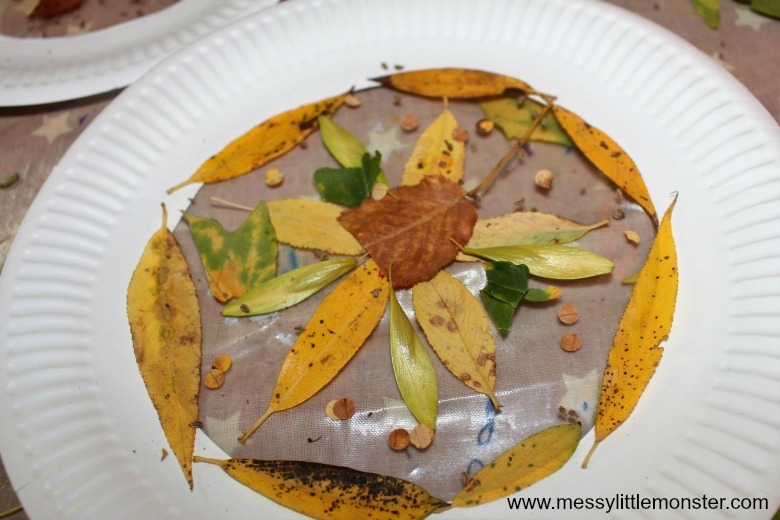 If you are looking for easy Autumn crafts for kids then this leaf suncatcher craft is perfect! Not only is this paper plate autumn craft easy enough for toddlers and preschoolers, it looks beautiful hanging up in the window. Follow our easy step by step instructions to make your own unique leaf art. No two leaf suncatchers will look the same, but they will all look stunning! There are so many fun autumn crafts for kids to get stuck into at this time of year! I love nature crafts and anything that gets the kids outdoors in the fresh air and looking for nature. 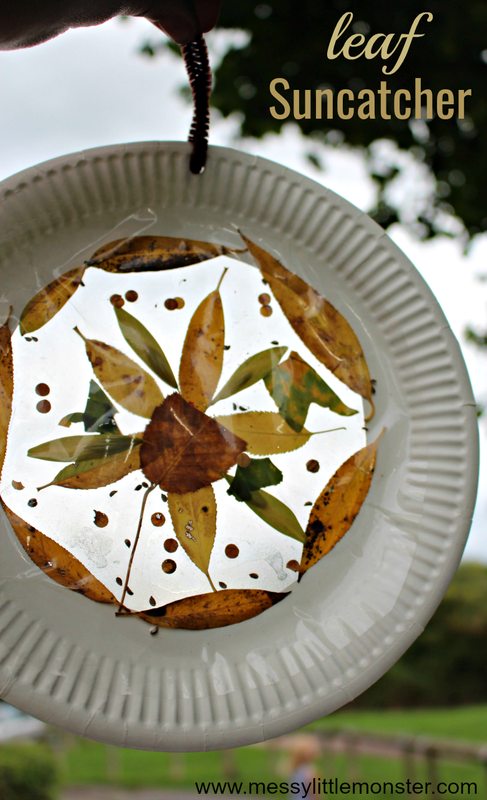 Head outdoors with your toddlers and preschoolers and help them to find a variety of different leaves that can be used to make this leaf suncatcher craft as well as some of our other fun leaf art activities. Below you will find step by step instructions for making a suncatcher craft, but don't forget to take a look at some of our other leaf art projects too! We have a fun leaf hedgehog craft that is super easy and even comes with a printable hedgehog, our leaf puppets are really easy to make using chalk pens or acrylic pens, or if you want to get messy with some paints maybe have a go at making some painted leaf monsters! We love making these easy suncatcher crafts from paper plates and nature. Take a look at our real flower suncatcher craft and our flower petal suncatcher that have been made using the same process. STEP 1: Collect some autumn leaves! 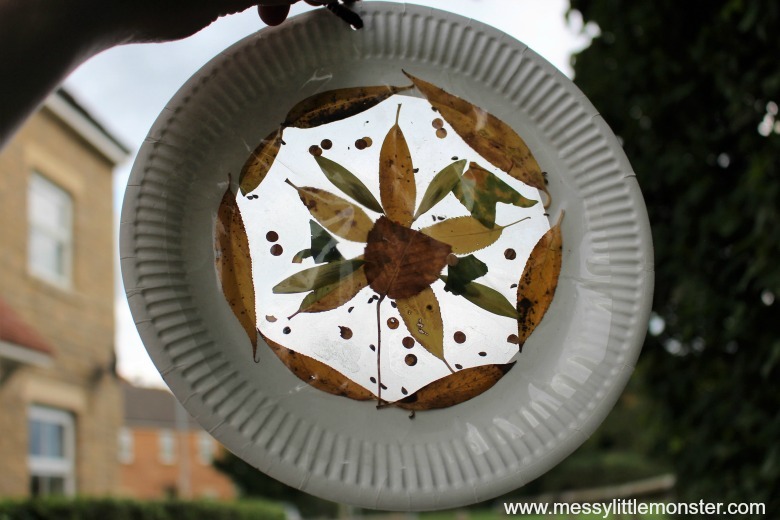 Before you can begin this leaf suncatcher craft you need to collect some leaves! 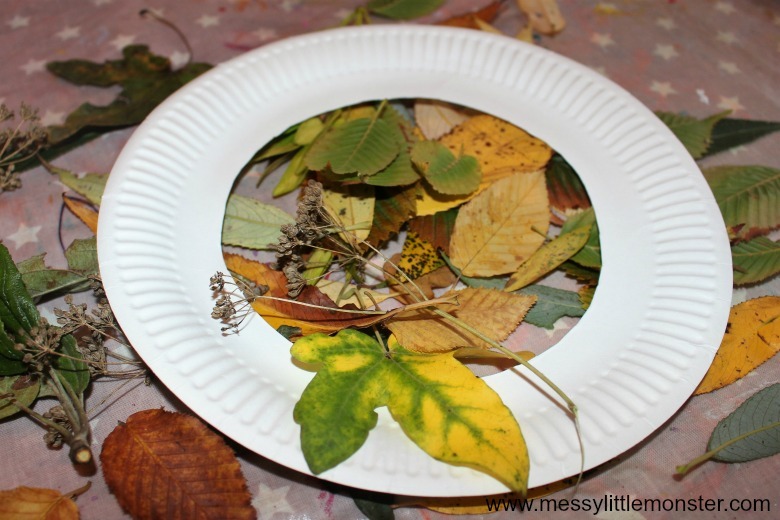 I always love activities that involve getting outdoors and collecting nature. Try to get a good selection of leaves in different sizes and colours. The frame of the suncatcher is made from a paper plate. You need to make a 'window' in the centre of the paper plate. There is usually a circle marked out on paper plates, I would suggest cutting along this line. 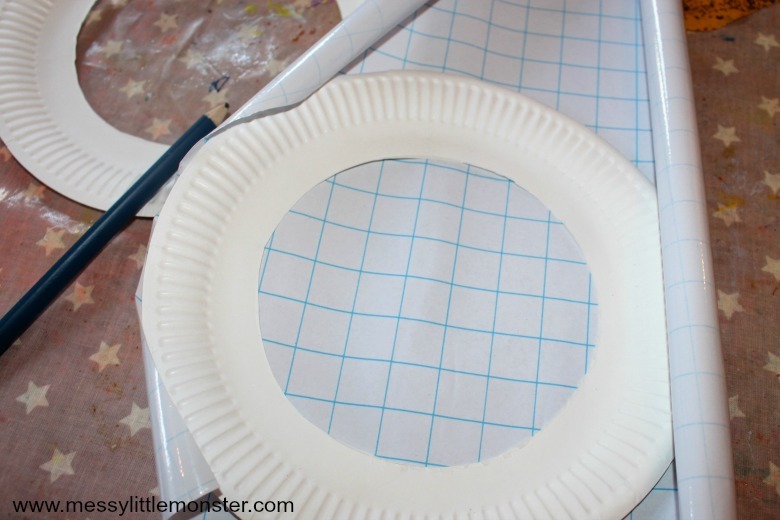 Once you have cut out the centre out of your paper plate you need to cut out two piece of sticky back plastic (contact paper) that are just slightly bigger than the hole you have cut out. The easiest way to make sure that your sticky back plastic is the correct size is to draw around the inner circle of your paper plate directly onto the sticky back plastic. Then once you have removed the paper plate draw a second circle around the first that is slightly larger. It is the larger circle that you will need to cut out. 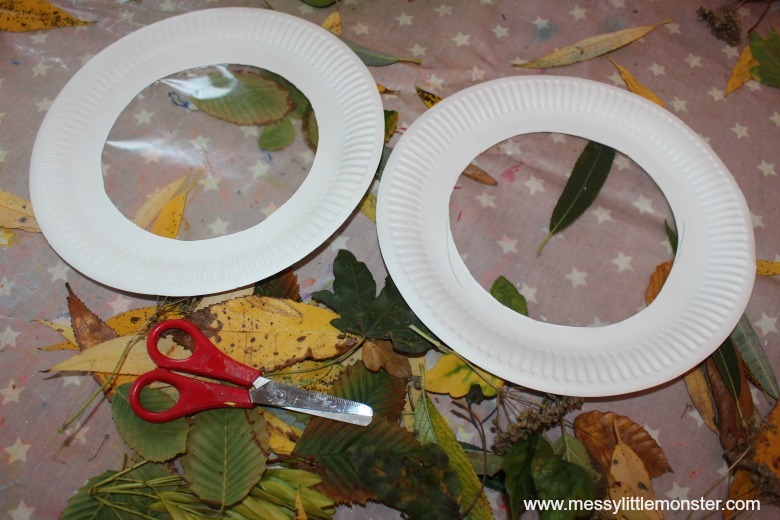 Make sure that you cut out two of these sticky back plastic circles for each paper plate suncatcher you are making. Stick one of the sticky back plastic circles to the bottom of the paper plate and keep the other to the side for later. Your sticky canvas is now ready and you can start arranging your leaves on your suncatcher! 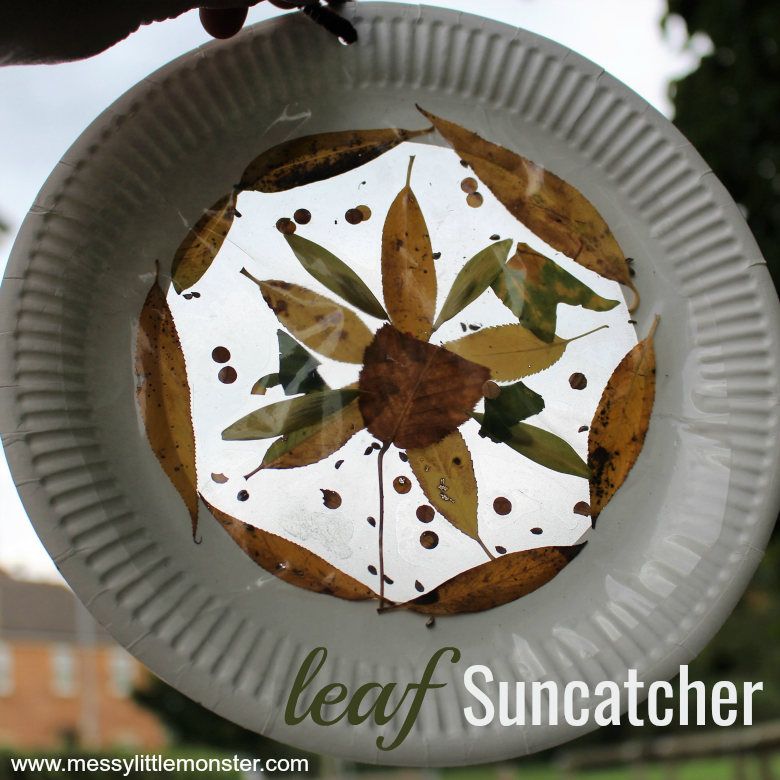 You can either lay the leaves straight onto your suncatcher or cut them into smaller pieces. Cutting the leaves is great practice for children working on scissor skills! You can be as creative as you like during this step, you may decide to make a pattern or picture from your leaves or just lay them on randomly. 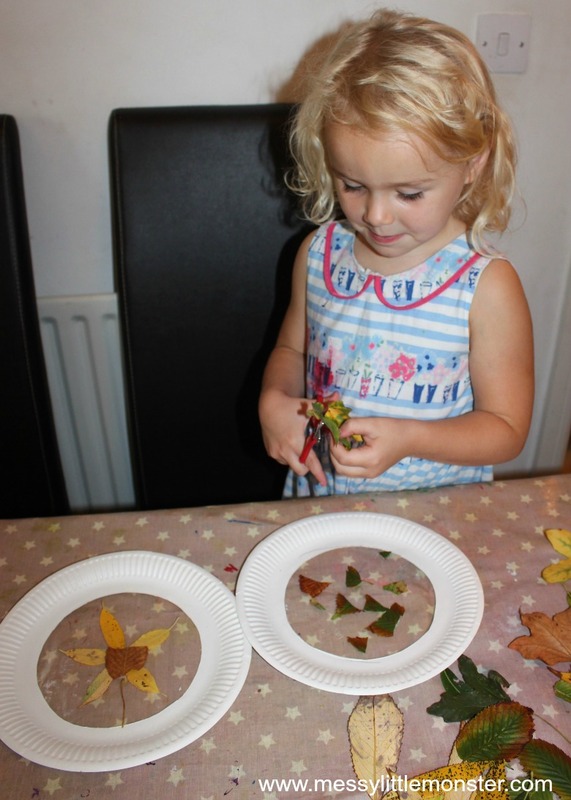 Daisy (aged 4) loved being able to cut the leaves up into tiny pieces before working on her designs. As well as using scissors to cut the leaves we used a hole punch to make some tiny leaf circles to add to our designs. Once you are happy with where you have placed your leaves cover the design with the second circle of sticky back plastic that you cut out earlier. Hang up your leaf suncatcher by making a small hole at the top of your paper plate and thread a pipe cleaner of some string through. This leaf suncatcher craft really does look beautiful hanging up in the window. 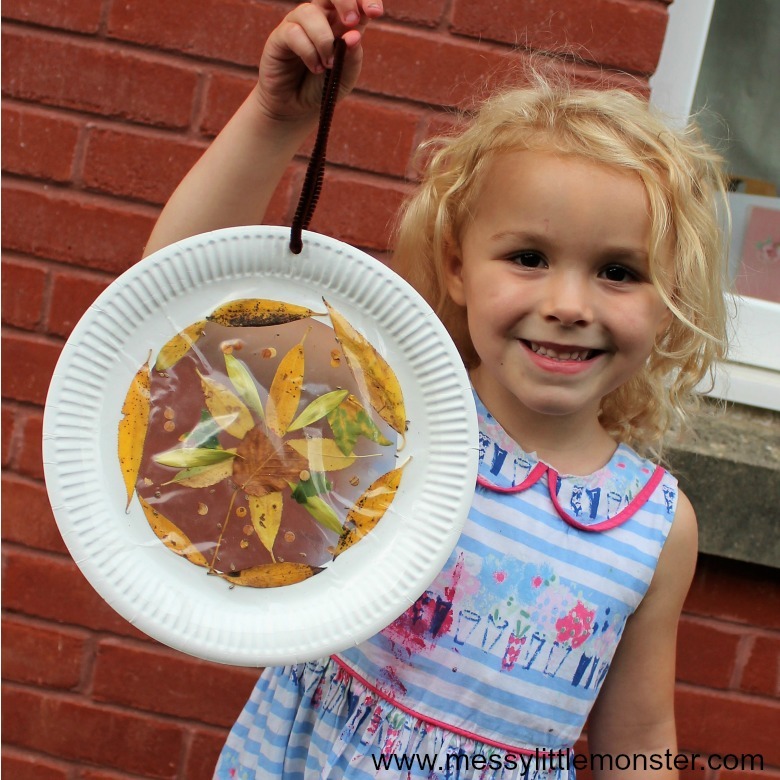 So if you are looking for easy autumn crafts for kids, you have definitely found one with this leaf suncatcher craft! This leaf art is perfect for toddlers and preschoolers and I love how every paper plate suncatcher will be completely unique!